Membership in the Milton Historical Society is open to all persons interested in the history of the Town of Milton. While most of our membership lives in Milton and the adjacent area, we have members from other parts of the Province of Ontario and in other provinces and countries. Through membership and attendance at our month meetings series you will learn about all aspects of our areas heritage. 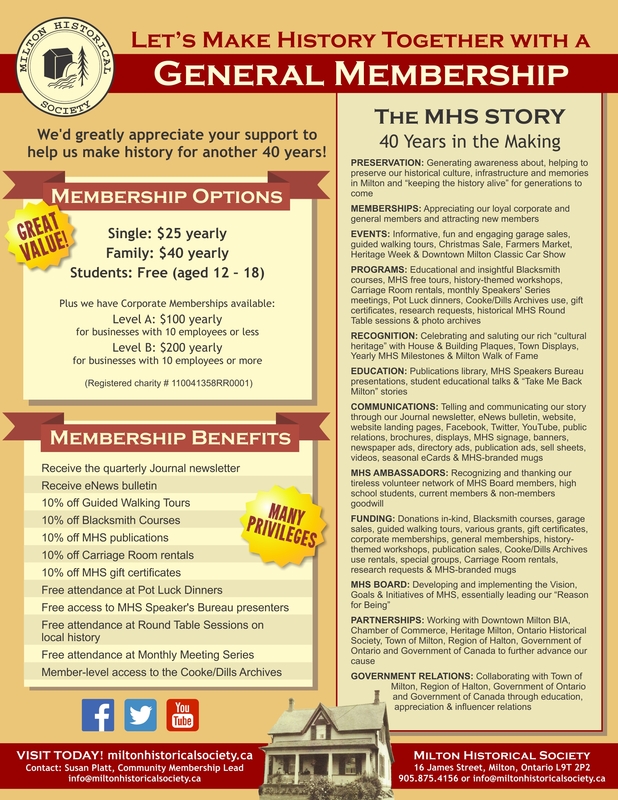 You will have access to our Milton Historical Archives, discounts on our publications and also receive our quarterly newsletter, “The Journal”, to name but a few of the benefits of membership. Find out more about General Membership benefits! All family members must share a single mailing address and will be contacted through the primary member's email. Are you a new or returning member? Volunteers help us forge our future! We know all members have certain unique talents, skills and abilities and ask you to share these, as our society relies on your active support and involvement. If you prefer, you can still download and complete the membership form in PDF. Then just mail or bring in your payment cheque to 16 James Street, Milton, ON L9T 2P4. The Milton Historical Society has now set up a foundation under the Community Foundation of Halton North (CFHN). You can also donate through this foundation towards the Milton Historical Society. Please contact our Society for further information.